President Donald Trump speaks during a ceremony honoring the World Series Champion Houston Astros, in the East Room of the White House, Monday, March 12, 2018, in Washington. 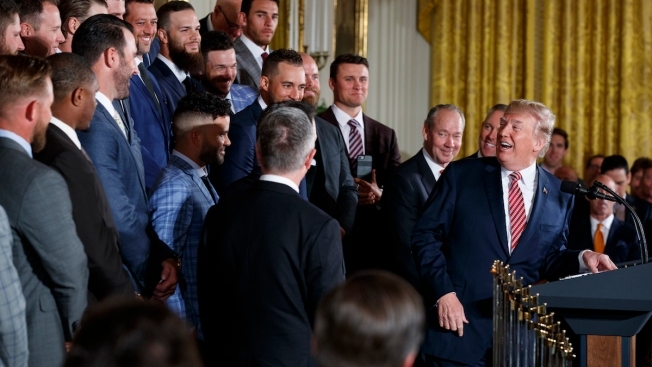 President Donald Trump honored the Houston Astros at the The White House Monday afternoon after their 2017 World Series win. The Astros used Monday's day off from spring training in Florida to fly to Washington for the White House ceremony. 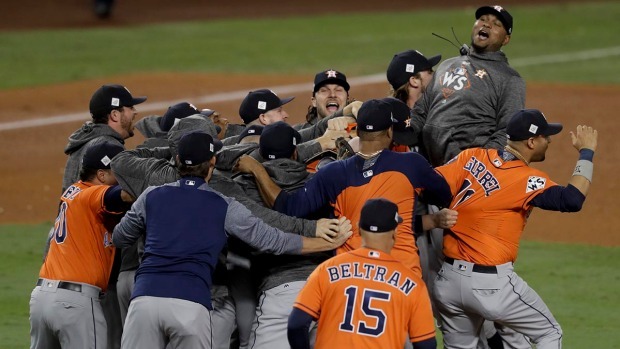 Houston defeated the Los Angeles Dodgers in Game 7 last year to claim the franchise's first World Series title. Trump called it "one of the greatest baseball games anybody's ever seen." The team presented Trump with a jersey. Rich Dauer, the now-retired Astros' first base coach, also went to the White House. Dauer nearly died after developing a blood clot near his brain minutes after the team’s World Series parade. He had emergency brain surgery and retired from the team. The Astros also invited players who left the team during the offseason, including closer Luke Gregerson (now with the St. Louis Cardinals) and pitcher Joe Musgrove (now with the Pittsburgh Pirates). Carlos Beltran, who was part of the World Series-winning team, said last month that he wouldn't attend the ceremony for family reasons. He said his decision wasn't a political statement, but added he wasn't happy with the federal government's response to Hurricane Maria in Puerto Rico, his native country. Visits to the White House by champion sports teams once were highly anticipated, but they have become politically fraught in the age of Trump. More than two dozen New England Patriots stayed away when the Super Bowl-winning team visited in 2017. Several had cited political reasons beforehand. The NBA champion Golden State Warriors avoided the White House on a trip to Washington last month.